Westeros, the setting for George R.R. Martin's Game of Thrones (I know the book series is called A Song of Ice and Fire, but for the sake of brevity, let's just agree to call it Game of Thrones), is vast and varied, containing thousands of square miles of land, all being fought over in one way or another by any number of people at a given time. With dozens of characters over such a large expanse of land, things can get more than a little confusing. Where was Jaime Lannister at the beginning of A Storm of Swords? What terrible place did Arya Stark find herself in at the beginning of season three? 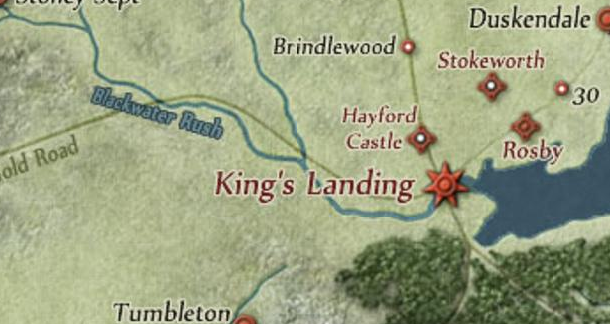 Well, if you have questions like this, a new, interactive map of Westeros will probably come as a welcome surprise. The map, available at quartermaster.info, uses the Google Maps API to deliver a massive, detailed layout of Westeros, with every city and major location marked. Click on each city and you get a link to a page on A Wiki of Ice and Fire. What's even better, though, is the map's timeline feature detailing each character's journey across the land in both the book series and the TV show, chapter by chapter or episode by episode. While the timeline doesn't say what the character was doing at each of those points (other than when they died, where their timeline marker is replaced by a skull, spoiler alert), it's still really interesting to see the journeys the characters have taken over the epic series. With the map using Google Maps technology, perhaps a comprehensive Street View map of Westeros is on the way?